Thank you to Sargento for sponsoring this post! You already know I enjoy challenges. I have a Make a Request! feature on my blog and I’ve had many readers issue me challenges to make or recreate certain dishes. Executing those dishes within the parameters I’m given while taking my own creative license are a lot of fun and very satisfying. I was recently extended another challenge, this time by Sargento® who gave me the challenge to create a dish using a specific set of ingredients. Some of you may already be aware that Sargento is hosting The Chopped at Home Challenge with a chance to win $10,000. Have you entered yet? You should! I don’t watch much TV but if I had to choose a favorite show that’s currently running, Chopped would be one of them. You almost find yourself biting your nails as you watch the contestants rushing to create something edible with the crazy list of ingredients they’ve been given – it’s pretty exhilarating! Picture this: A basket containing spaghetti, enchilada sauce, caviar, and bean sprouts. Or how about mahi-mahi, Nacho Doritos, and blue raspberry twizzlers? That’s the kind of torture Chopped puts its contestants through. Fortunately The Chopped at Home Challenge a little more merciful! 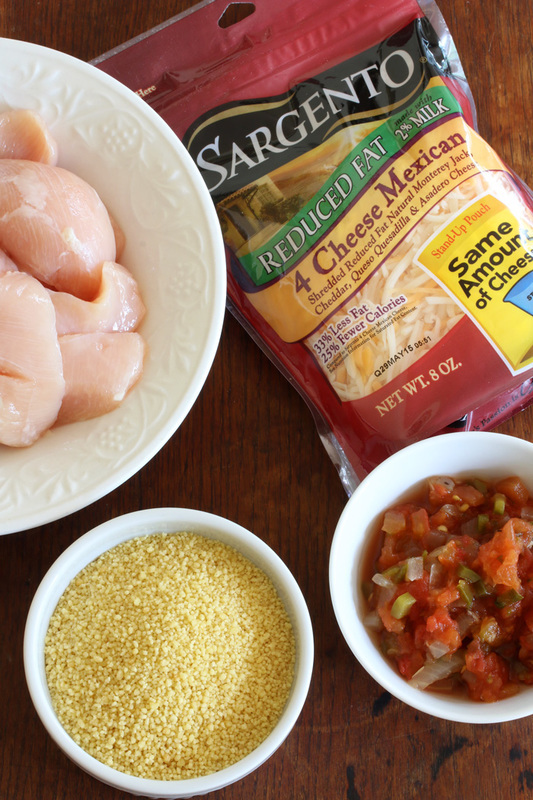 Here’s what Sargento put in my basket: Boneless Chicken Tenders, Sargento 4 Cheese Mexican Cheese, Couscous and Salsa. Really not bad at all, huh? We can work with that! Though I don’t mind being a little adventurous, I immediately ruled out Chinese. Chinese food with cheese? No thank you! (Have you ever seen dairy in Chinese food? Right, it just doesn’t happen. Some Chinese friends of mine like to joke that white people smell like cheese. That’s probably true!) And the combination of cheese and salsa in an Indian dish – though doable – didn’t get me too excited. After a brainstorming session I had lots of fun ideas for ways to incorporate these ingredients. 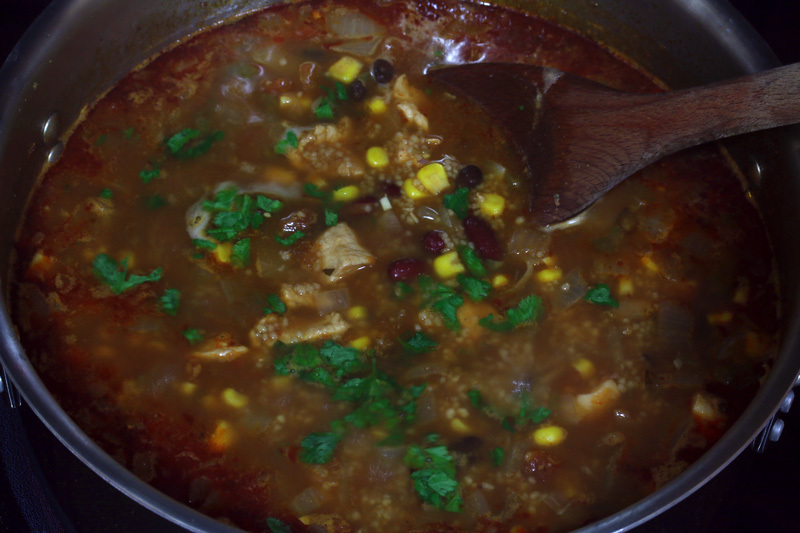 But I also wanted to make a dish that you would actually make and eat – in other words, nothing too “out there.” And so I went with a Mexican theme and this delicious Chicken & Couscous Chili was born. 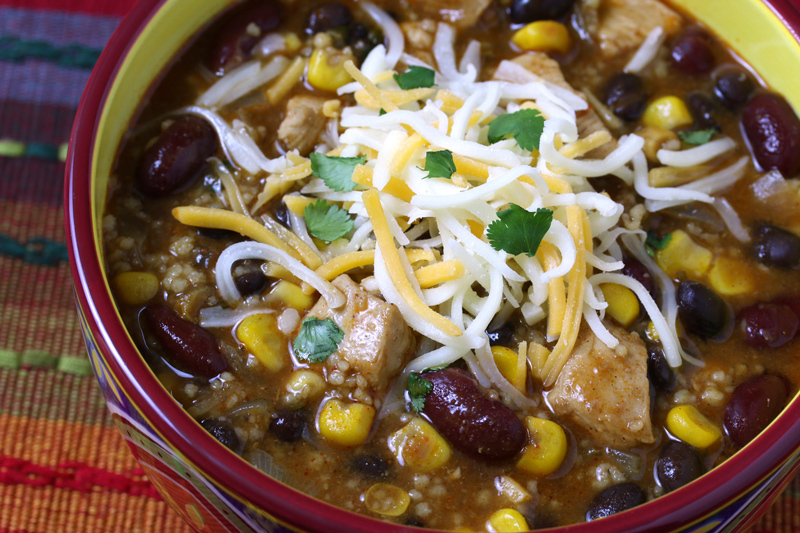 This Chicken & Couscous Chili has a fantastic, rich flavor and the couscous adds a really nice texture. Easy, fast, satisfying and delicious – always a winning combination! Heat the oil in a medium stock pot and saute the onions until soft and translucent, 5-7 minutes. Add the garlic and jalapeno peppers and cook for another minute. 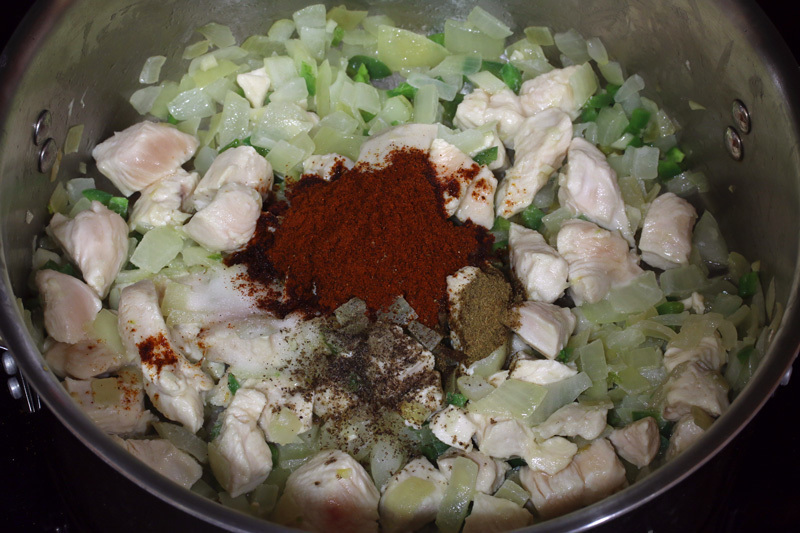 Add the chicken and cook until most of the pink is gone. Add the chili powder, cumin, salt and pepper and cook for another minute. Add all remaining ingredients except for the couscous, cilantro and cheese. 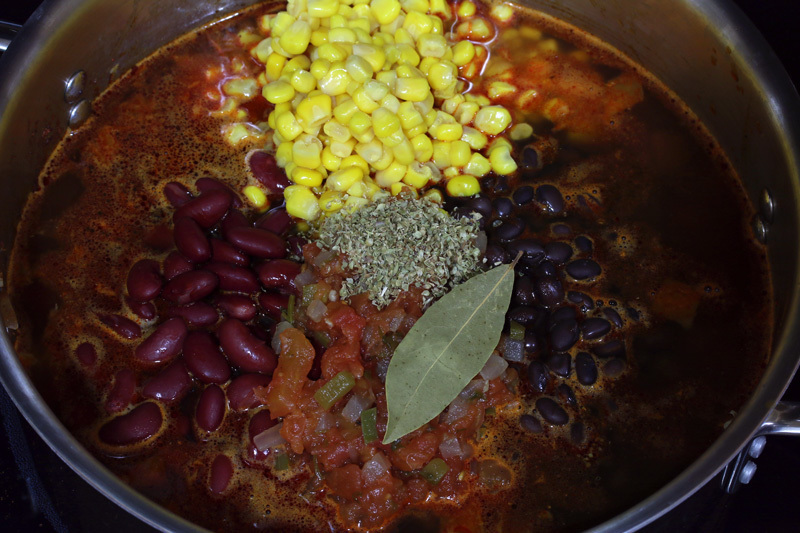 Bring to a boil, reduce the heat to medium, cover, and simmer for 20 minutes. Add the couscous and return to a simmer for another 10 minutes or until the couscous is done. Serve topped with shredded cheese and sour cream if desired. Enjoy! And now it’s YOUR turn! The Chopped at Home Challenge gives viewers a chance to create their best recipe using the selected basket ingredients, including Sargento Shredded Cheese, for a chance to win $10,000! 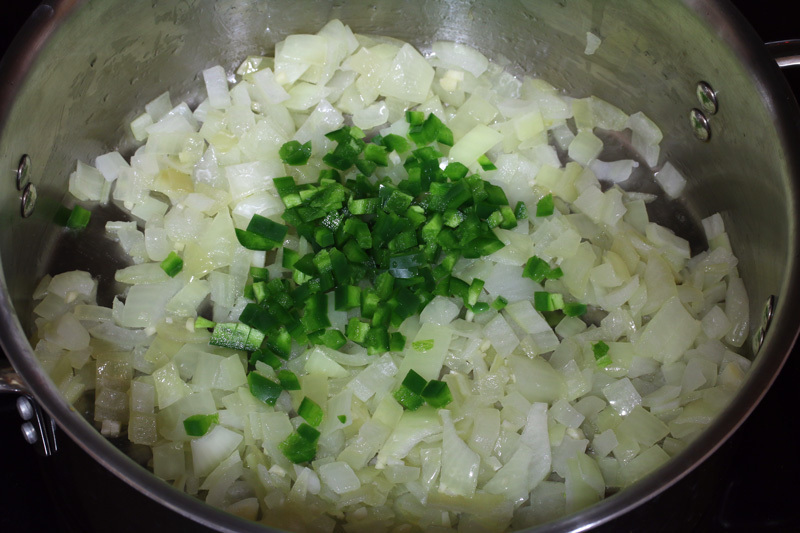 Heat the oil in a medium or large stock pot and saute the onions until soft and translucent, 5-7 minutes. Add the garlic and jalapeno peppers and cook for another minute. Add the chicken and cook until most of the pink is gone. Add the chili powder, cumin, salt and pepper and cook for another minute. Add all remaining ingredients except for the couscous, cilantro and cheese. 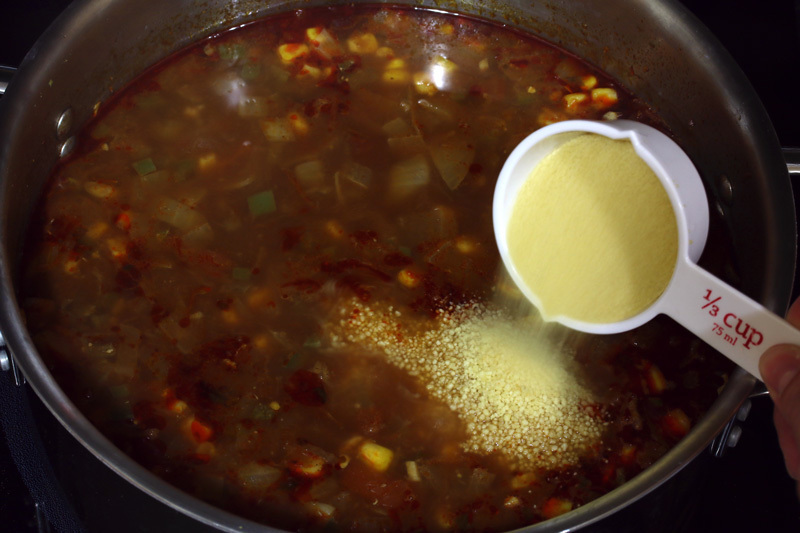 Bring to a boil, reduce the heat to medium, cover, and simmer for 20 minutes. Add the couscous and return to a simmer for another 10 minutes or until the couscous is done. Stir in the cilantro. Serve topped with cheese and sour cream if desired. Available in 30 versatile varieties, unique blends and distinct cuts, Sargento Shredded Cheese is always cut from blocks of 100% real, natural cheese. For more inspiration, check out the Sargento Pinterest page Pinterest.com/sargentocheese/ or visit Sargento.com for more information. The Chopped at Home Challenge gives viewers a chance to create their best recipe using the selected basket ingredients, including Sargento Shredded Cheese, for a chance to win $10,000! Disclosure: This post is sponsored by Sargento. All opinions, as always, are entirely my own. This looks and sounds deeeelicious!! Well done!! Coucous is my favorite! What a great way to use it! What a fun challenge, and what a delicious way to use the ingredients they gave you! I adore couscous and love the twist of using it in chili! Brilliant! This dish is so easy, so quick – definitely the kind of dish people will actually make – which is why I’m totally pinning this to share! Yum! Perfect fall comfort food! Thanks so much, Shelley! :) I love couscous too and this was a fun challenge. Thanks so much for pinning! I recently found out about recipe contest and am always on the lookout after being a current semi-finalist in one. I’ll have to check this out! 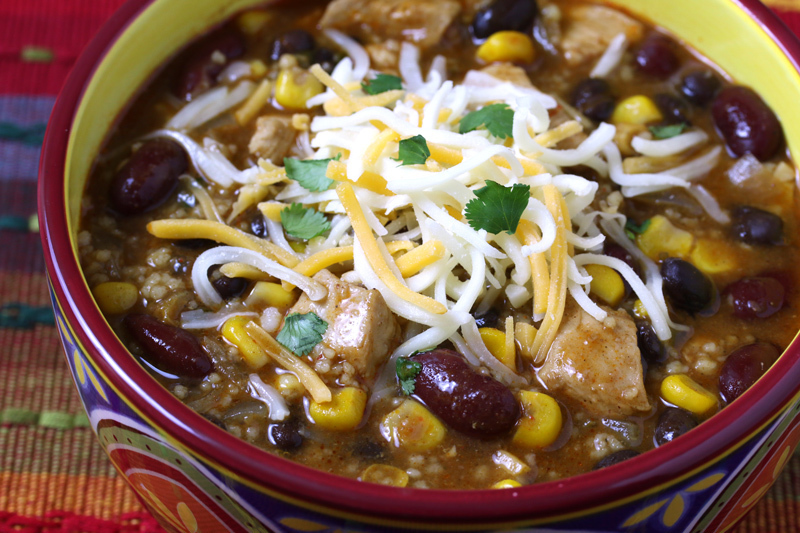 How fun to take on a Chopped style challenge, your resulting chicken and couscous chili sounds wonderful! What a great idea for the ingredients given! 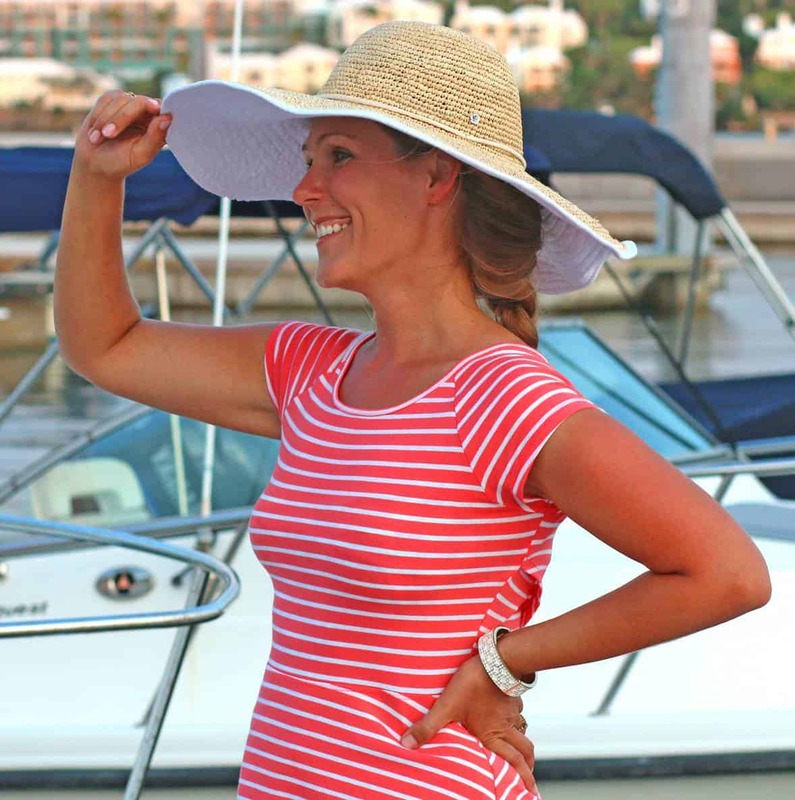 Looks perfect for the cooler days coming. Definitely, Serene, I love the Autumn because it means lots of tummy-warming soups and stews! What a fun challenge! And you totally rocked it adding the couscous to chili! Love this! Thanks, Lauren! 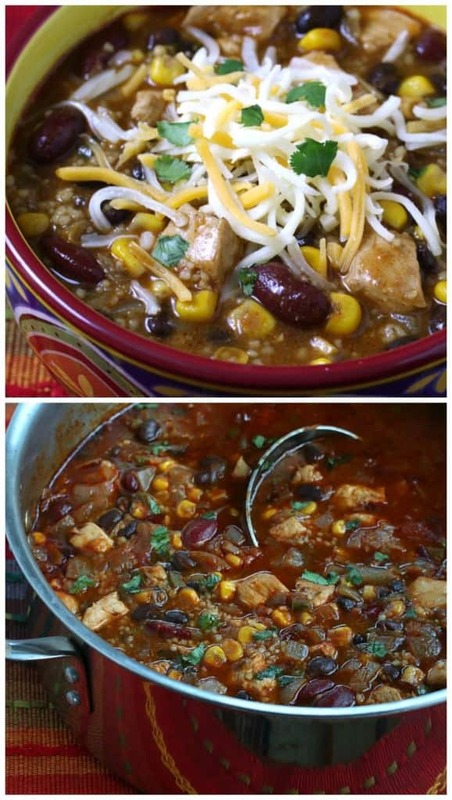 :) It was a fun challenge and without it I probably never would have thought to add couscous to the chili – it’s an awesome addition, great texture! Now this is a fun way to sponsor a post! Such a cool idea, and what a great dish you made! Isn’t it, Laura?? I’d love to have more posts like this! You totally stepped up to the challenge! That chili looks delicious and healthy! Your creation looks wonderful! This is definitely something I know my family would enjoy. 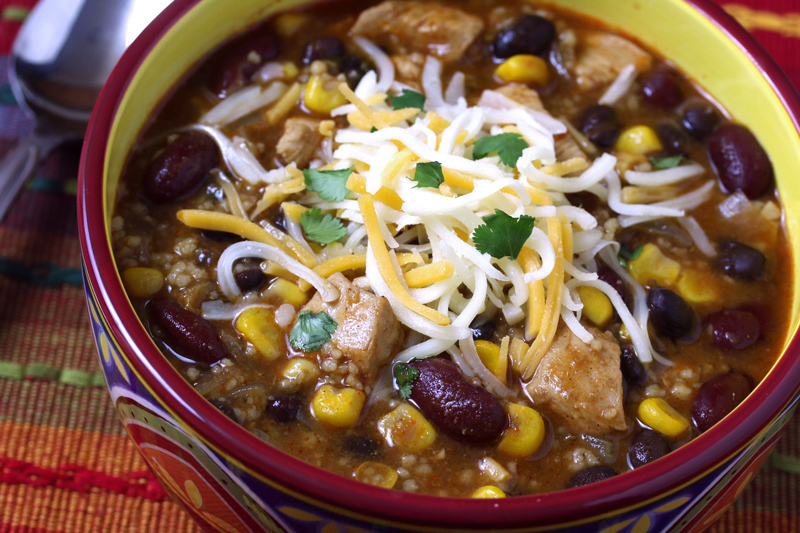 As soon as the weather cools off, I start craving soup and chili! 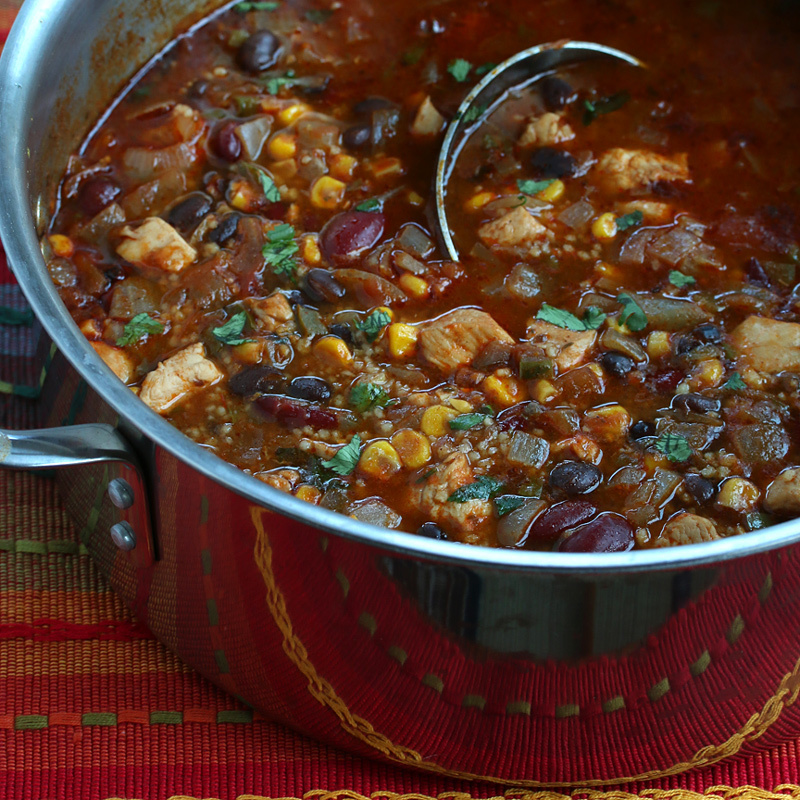 I could eat chili all day along…and so wishing I had this right now to devour! I love the idea of putting couscous in it!! Looks nice and hearty! This has been a staple of my home cooking for a long time. I usually whip up a big batch that lasts me a good while. I skip the salsa and the chipotle en adobo (no idea where to get that where I am based), plus the cheese. I tend to add a tin of tomato puree in the beginning. An added bonus the nice reddish hue. I have a batch cooling down on the stove at the time of writing. This time I experimented with adding a dollop of sriracha, works fine. Thanks for the recipe! I’m so happy to hear that, Jani, thank you!